I break my hiatus for you, Eleana! 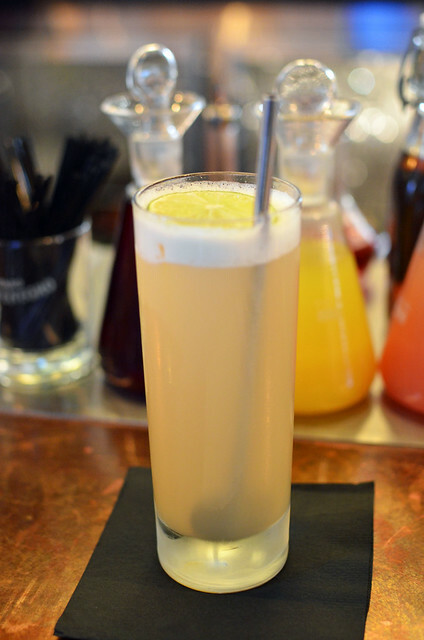 I told our friendly bartender that I like Moscow Mules and Dark and Stormies (basically anything gingery), so she crafted me a lovely ginger and rye drink. Nice combo! 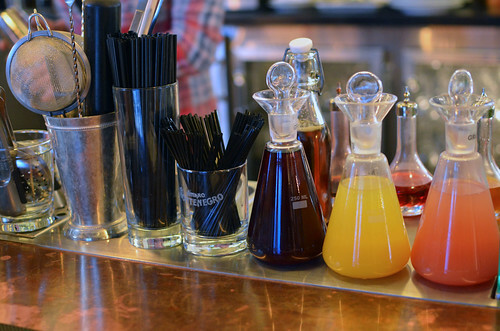 Bespoke cocktails cost $12. 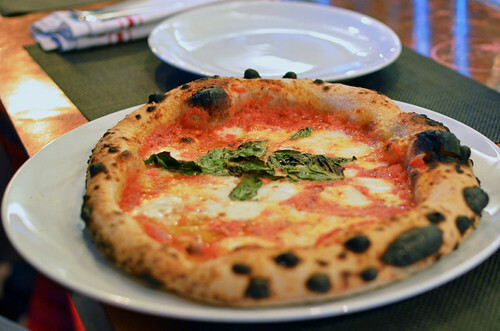 Margherita pizza -- San Marzano tomatoes, mozzarella, basil, olive oil, sea salt ($15). John, our neighbor at the bar, ordered this and insisted that we each try a slice while he waited for his friend to arrive. Who are we to turn down free pizza? Light and tasty! Thanks, John! 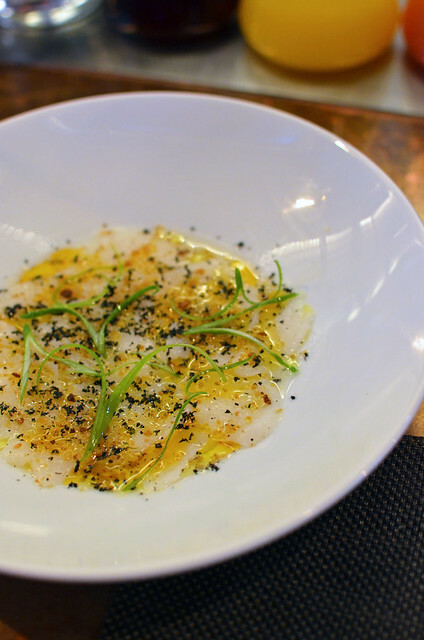 Hand-harvested diver scallop crudo, squid ink bottarga, breadcrumbs, chili oil, lemon, scallion ($14). Fresh and salty! A bright start to our meal! 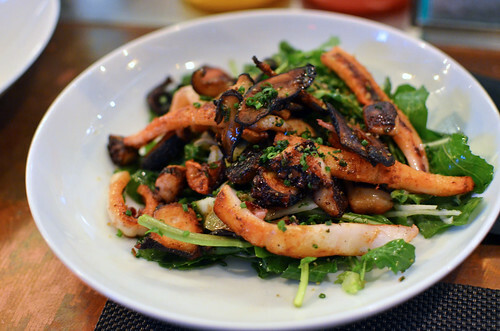 Pan-seared octopus and calamari, fennel, mixed mushrooms, arugula, aged balsamic ($16). Awesome. 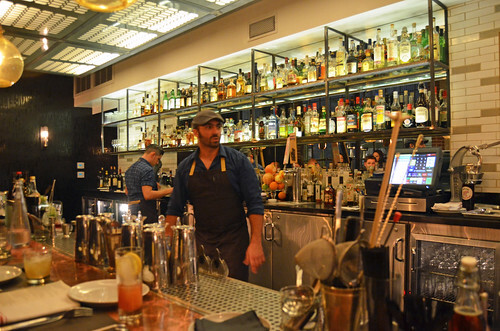 Eleana remarked that the octopus was not over-charred as it often is at many restaurants. I agreed. You want octopus and squid well prepared? Order this. 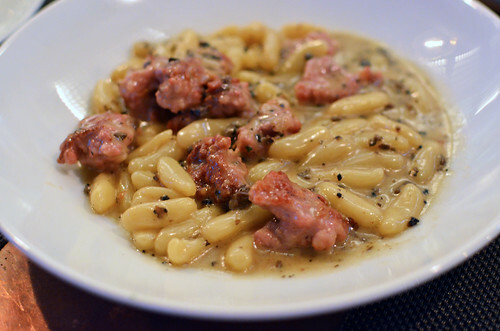 Cavatelli alla norcina -- ricotta dumplings, housemade pork sausage, black truffles, grana padano ($27). This dish was kind of a dream come true -- a punchy, porky, springy, rich, and truffle-y dream come true! 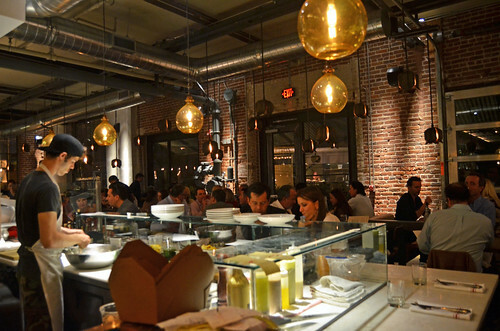 We agreed this was the best dish of the night, and it merited its hefty price tag (well, hefty for pasta anyway). Shout-out to my bro for texting me to get this. That guy knows his food. You should trust all three of us on this one. 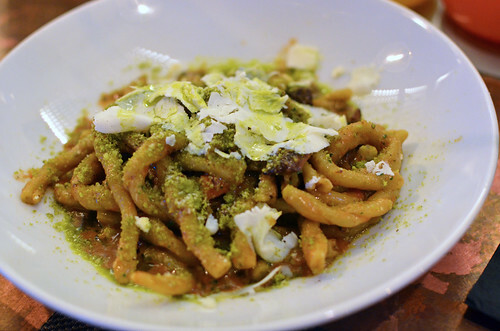 Fusilli lunghi al sugo di cinghiale -- hand-rolled pistachio pasta, wild boar ragu, housemade ricotta salata, pistachio oil ($18). Pistachio pasta? I couldn't resist. Pistachio gelato is my favorite gelato. Pistachio macarons are my favorite macarons. How could I not order this? Sadly, while we enjoyed this dish, I couldn't really taste any pistachio. Maybe I wasn't supposed to, but still. I expected something really special, and I didn't get it. 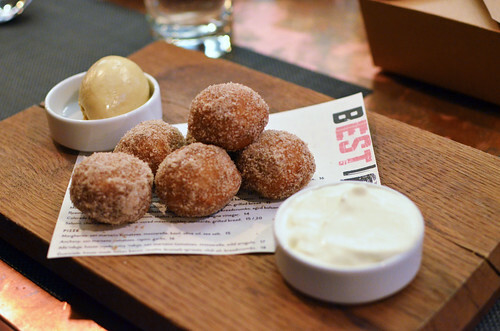 Coffee and donuts -- spiced chestnut zeppole, simple whipped cream, coffee gelato ($11). Hot donuts with milky sides are always a winner. No surprise here. Yummy. Sometimes you feel like a blog. Sometimes you don't. Hope you liked my break from my break. I heart a break from your break. Thanks for dinner last night! Next time I will get you pistachio macarons instead. And mmmmm I can eat that leftover truffle pasta for lunch. I guess twitter will work. I think you will just have to come back over and over and over to see if there's new content. LOL.